I've been running now for 6 months and I still consider myself very much a beginner. In terms of kit, pretty much everything I have at the moment I consider to be "essential"- I haven't really started to buy lots of fun things to run in or extra gadgets (although I believe a certain someone is buying me a Garmin GPS watch for Christmas!). I started out with just a water bottle, headphone and an iPhone band, and gradually over time I have built up a reasonably-sized running kit. I still don't know enough about running to know if what I have is the "best", but for me, everything works well and supports my running. I have no brand loyalty in any way, and tend to buy most of my running things from Sportsshoes.com or Sportsdirect.com. I like to do some research before my purchases and always read reviews. I definitely don't think you need all these things if you're just getting started, and I've been slowly adding to my collection over the last 6 months. 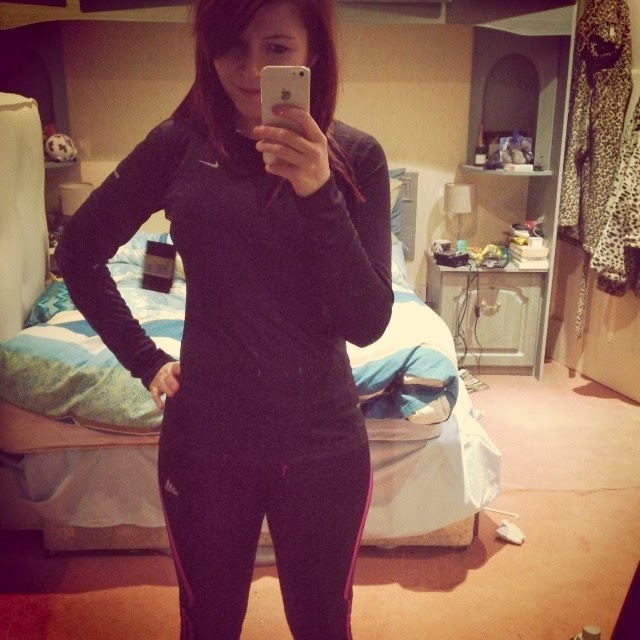 You can definitely get by as a beginner with just a good pair of trainers, leggings and a tshirt- this was how I started! Buying running clothes and accessories has taken over from buying day to day clothes and accessories and for me that's really cool. 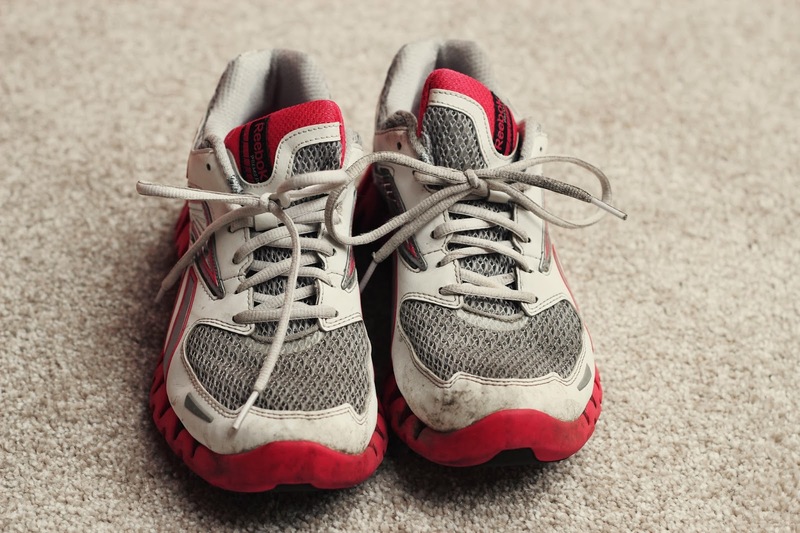 My focus on running pieces is about practicality and comfort, looking good is an occasional bonus, and plus I wear my running clothes and four times a week so they get a lot of wear! I imagine I'll be adding to this list over time as I get more proficient at running and as the seasons change, and maybe I'll write another post in 6 months time (I'm hoping to get some new trainers for my birthday in March!). Oh also, I've included as many links as possible in this post. These aren't affiliate links, but just so you can find exactly what I bought should you want to! These are my absolute running essentials- my iPhone with my Endomondo app, an iPhone armband, headphones and a water bottle. 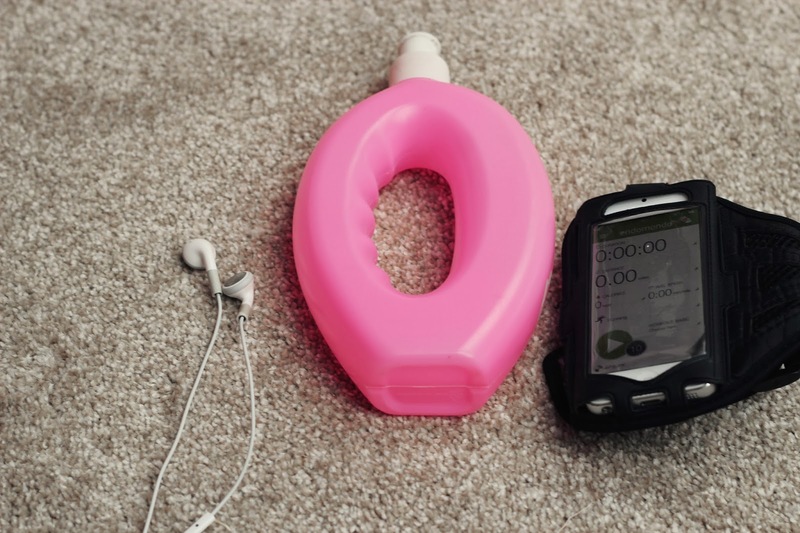 On my first few runs I carried a bottle and my phone, which got annoying, so these were the first things I really needed. I personally take a water bottle with me on every run- even if it's only 2 or 3 miles- but that's totally your shout. An O-shaped bottle is great for holding while you run. And of course, the most important part of my kit, my trainers. Again, no brand loyalty, I just went into the Reebok/Adidas outlet in my town and asked for some advice. These are great trainers and I really noticed a difference when I started wearing them. Plus they were only £18! They get a lot of wear, and I'm glad to see they're finally mucky and well-worn, and not as sparkling white as when I first bought them! Because I tend to run early in the morning, I need to make sure I am seen by cars (obviously). Whilst all my running clothes are reflective, they're not reflective enough for running in the dark. For a while I wore my dad's too-big hi-vis, but then I found this awesome pink Ron Hill one. It also has LED lights down the back. I also have a LED light for the back of my rain jacket (it just sticks on the back) and I have an ID bracelet from ICE ID. I actually discovered ICE ID while looking for some reflective wristbands and I realised I don't carry any ID when I run. Mine lists my name, parents' phone numbers, postcode, blood type and that I'm an internal organ donor. 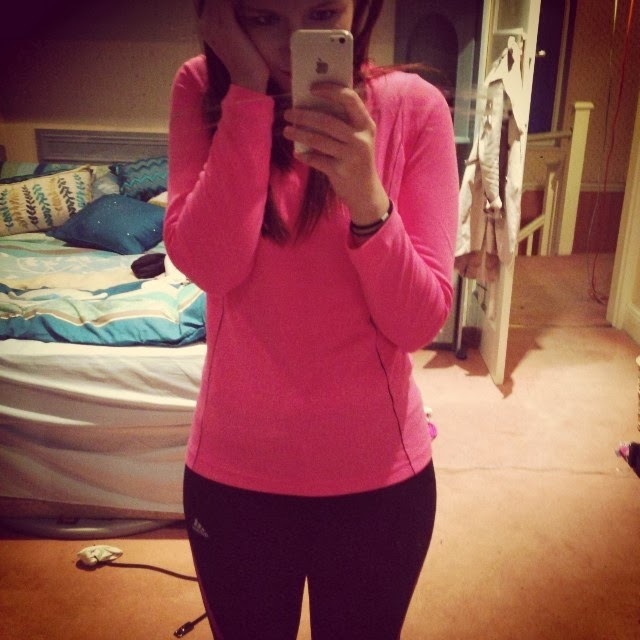 I wear this on every run, whether it's dark outside or not. Now obviously running in winter is a LOT different than running in the summer. 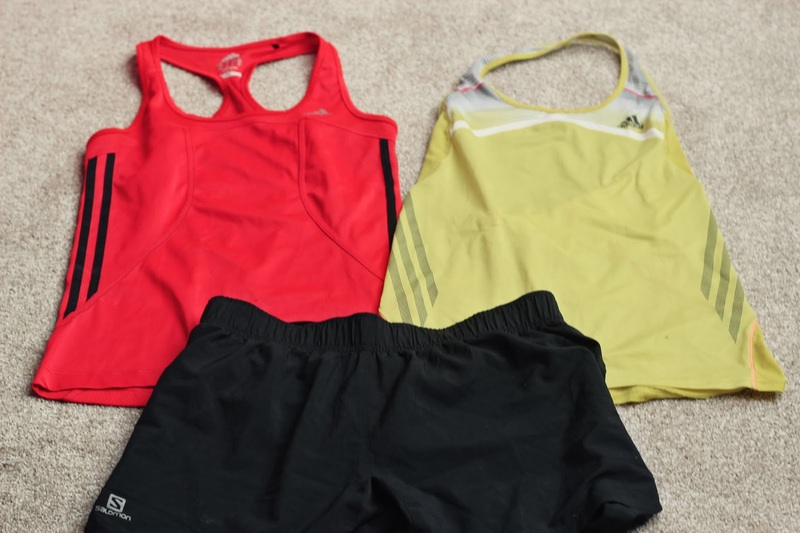 I had to do a lot of research and ask a lot of questions to figure out what to wear for winter running. General consensus was to avoid wearing more clothes but to make sure ears and hands were well-covered, so I have some Nike running gloves, which are also touch-screen friendly, and a nice fleecey headband. I invested in some Nike wicking socks too after reading about the importance of good socks in Running Like a Girl. So for summer, I have shorts and vest tops (red/yellow). When it came to shorts, I just didn't want anything...lycra, and these shorts are perfect. They're comfortable but not too fitted. 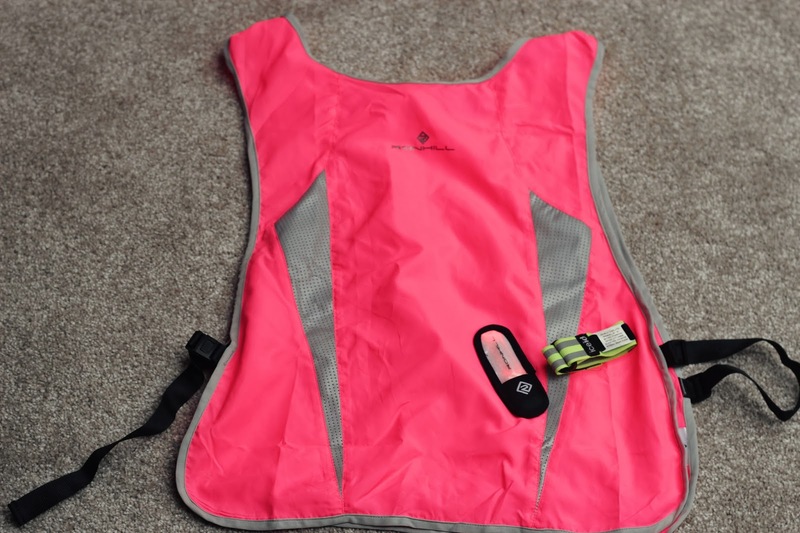 I also have two running vests so I can have one clean and one in the wash. When it got a little colder around October/November time, I moved from vests to short-sleeved tops. 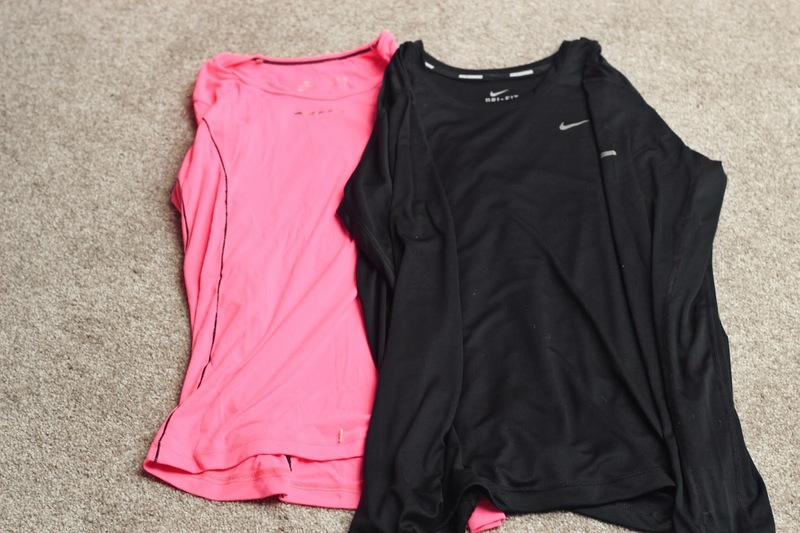 These tops are the same, with one pink and one black, and they were £7 from Sports Direct. It takes a lot for my legs to get cold, so I was still wearing these shorts well into November. I found overheating to be much more of a problem than getting too cold! I have run in just leggings and a long sleeved top in temperatures down to about -2 degrees celcius with no complaints, but it hasn't gotten colder than that so far. When it does I'll keep you posted! Welcome to England. It rains a lot here. 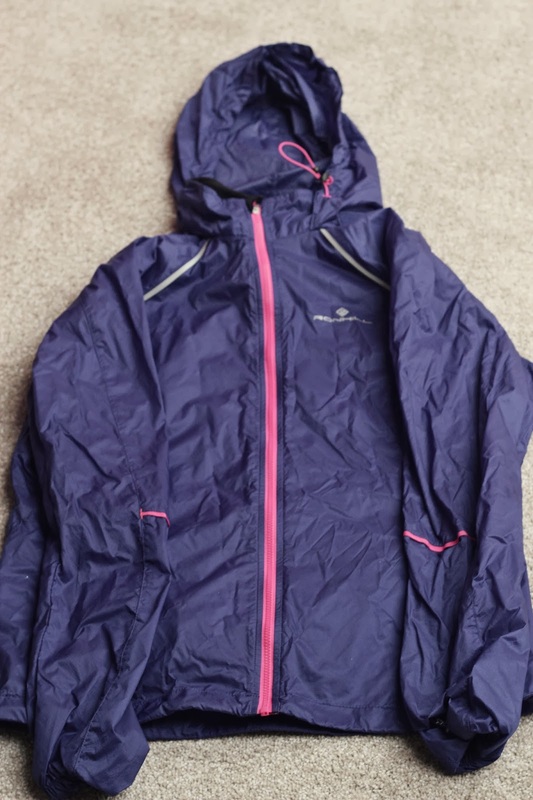 A good rain jacket was actually one of the first running investments I made. 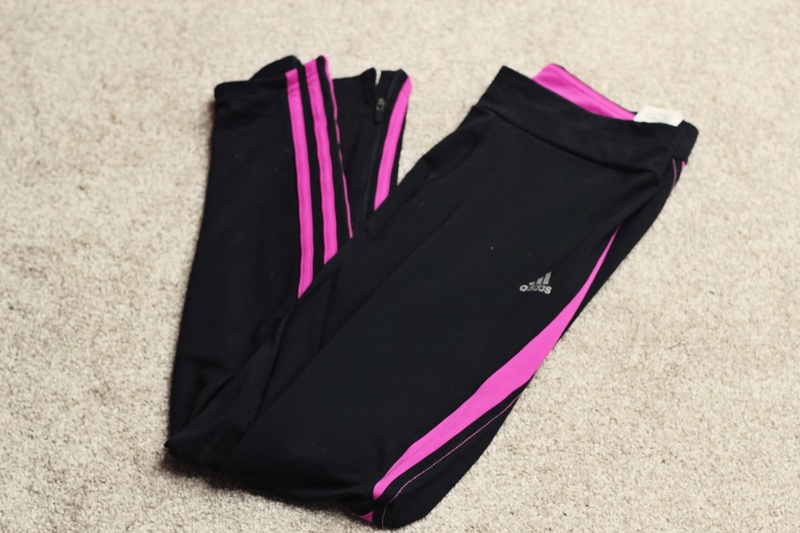 I used to run in a big Primark waterproof but it was entirely impractical. To be honest, I don't wear this jacket too often for fear of overheating (and also, weirdly, because I seem to always miss the rain!) but it's super lightweight and perfect for the winter. I also bought the LED light I mentioned earlier for on the back so I don't have to wear it AND my hi vis. Ladies, I don't have to tell you the importance of a good sports bra. 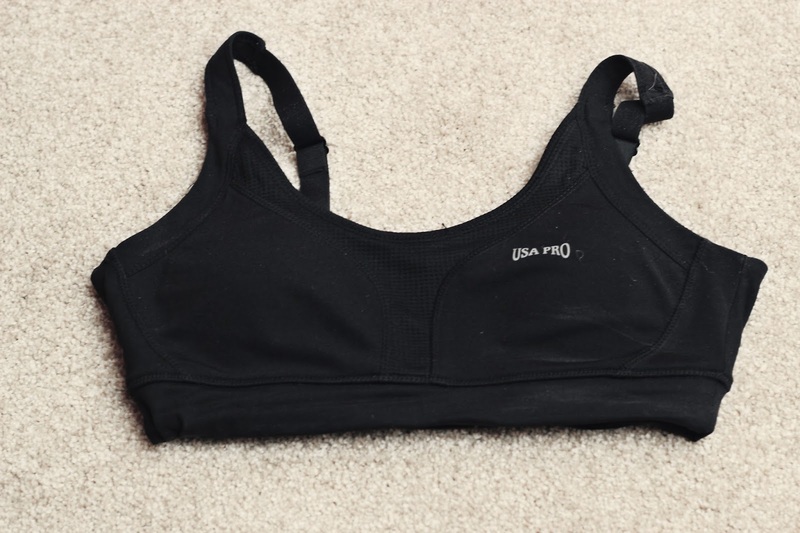 I might not have much to support (ahem) but I definitely feel much more secure in a "proper" sports bra instead of just a cheap one from Primark. This one was a big weird as it came in dress sizes rather than bra sizes but it does the job! I guess this are the non-essential bits. My Polar FT4 was a bit of a splurge but I love it. 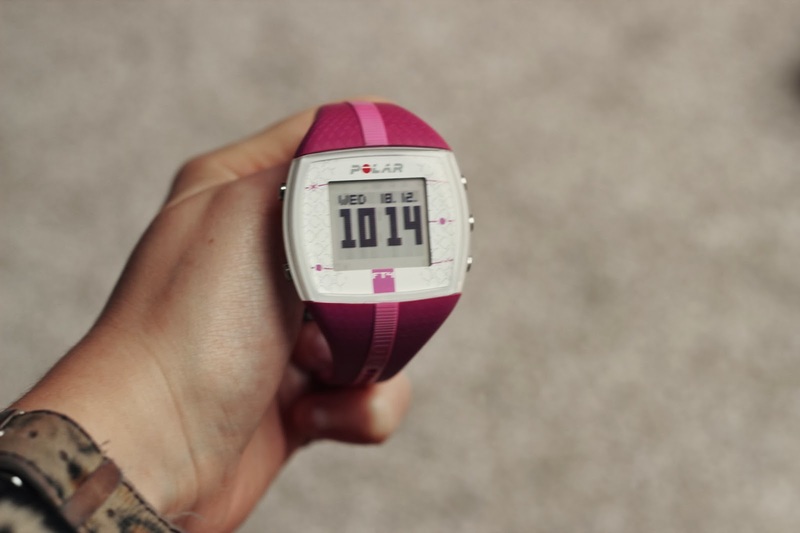 It's so useful for keeping my heart rate down on long runs and to get an accurate idea of how many calories I've burned on a run so I don't go mad on the crisps when I get home! 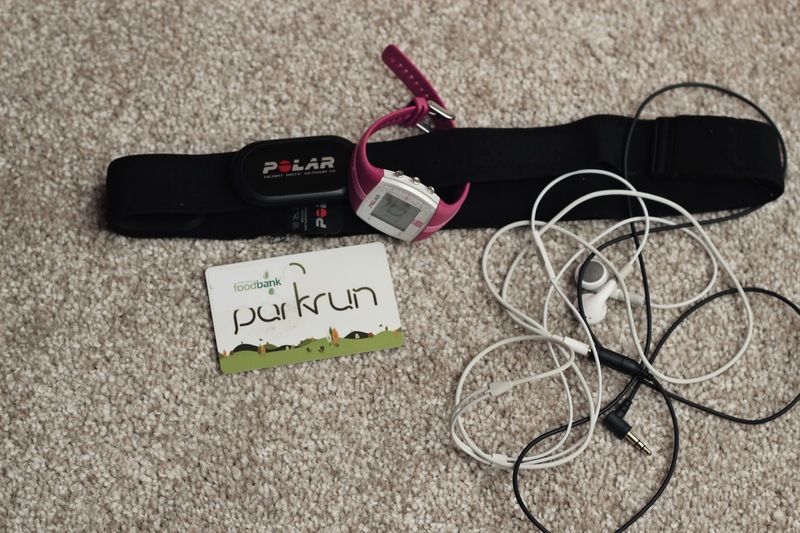 Also shown here is my Parkrun barcode, which just means I don't have to worry about my paper one, and my headphone extender. I run my headphones up the inside of my tshirt and through the collar to stop it flapping around and annoying me, but I was finding that my headphone cable was too short and it kept making my top ride up, so I bought a cheap headphone extender from amazon. Now my headphones are super long so I just tuck the cable into my leggings or shorts. Much better than my tshirt riding up though! And that's my kit! Next on my list? A Garmin Forerunner 10 to track my longer distances. I've started to find my iPhone battery running out on longer runs so I think my lovely boyfriend has got me one for Christmas. I'm also not sure yet if I might need another layer for the winter. I'm sure over time I'll start collecting more fun tops and leggings (Rosie has an amazing pair of Adidas galaxy-print running tights which I adore but they're not longer available!) but for now I have everything I need. Nice post. I just started getting back into my workout routine. 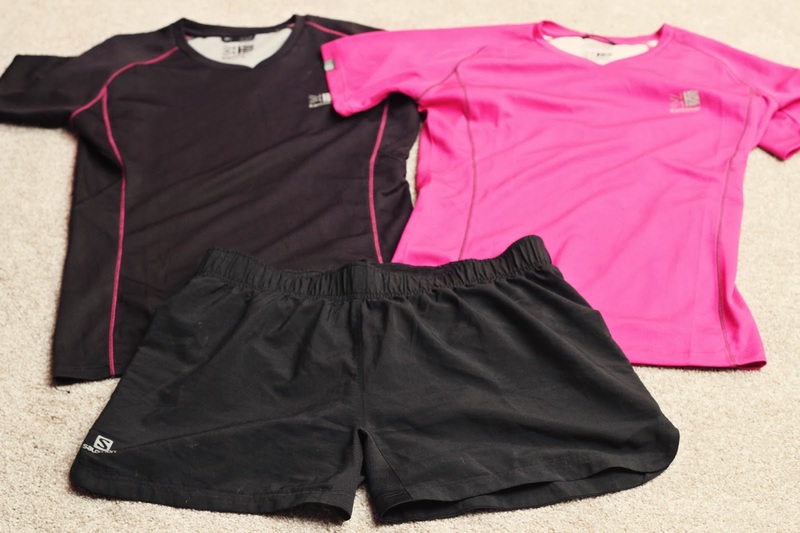 I asked for comfortable womens clothes for Christmas this year so I can have something to run in. All I pretty much own is jeans and that wont work. I really like that rain jacket, I will have to get one. Thanks for sharing Charlotte! I should've found your blog months before I decided to sign up for my half marathon this Sunday (January 12). Maybe it could have helped me with my training.lol This race is my 3rd. (1st was 3K and 2nd was 6K years ago). It is a veeerrryy ambitious goal to do a 21K and not to mention signing up alone. I'm not sure about my level of fitness but I do a little running, mountain climbing and some HIIT all for the goal of losing weight. I am anxious to do the 21K this weekend since I have not trained enough but there's no turning back. I just hope I finish the race with NO injuries whatsoever.